^ Owen-Smith, Norman (1984). Macdonald, D. (ed.). The Encyclopedia of Mammals. New York: Facts on File. pp. 490–495. ISBN 978-0-87196-871-5. ^ Houck, ML; Ryder, OA; Váhala, J; Kock, RA; Oosterhuis, JE (January – February 1994). "Diploid chromosome number and chromosomal variation in the white rhinoceros (Ceratotherium simum)". The Journal of Heredity. 85 (1): 30–4. PMID 8120356. ^ Panda, Sasmita; Panigrahi, Gagan Kumar; Padhi, Surendra nath (16 February 2016). Wild Animals Of India. Anchor Academic Publishing. ISBN 9783960675143. ^ Beachy, Ben (7 December 2015). "Sharks, Tigers, and Elephants: New Analysis Reveals TPP Threats to Endangered Species". Sierra Club. ^ Lacombat, Frédéric (2005). "The evolution of the rhinoceros". In Fulconis, R. (ed.). Save the rhinos: EAZA Rhino Campaign 2005/6. London: European Association of Zoos and Aquaria. pp. 46–49. ^ Geraads, Denis (2010). "Chapter 34: Rhinocerotidae". In Werdelin, L.; Sanders, W.J. (eds.). Cenozoic Mammals of Africa. University of California Press. pp. 675–689. ISBN 978-0-520-25721-4. ^ Baker, Aryn (29 January 2016). "Legalizing the Sale of Rhino Horn May Only Endanger the Animals More". The New York Times. Retrieved 24 July 2017. ^ Actman, Jani (3 October 2016). "The World Votes to Keep Rhino Horn Sales Illegal: A proposal by Swaziland to legalize trade in rhino horn was rejected at the wildlife trade conference in South Africa". National Geographic. Retrieved 24 July 2017. ^ Bale, Rachael (22 September 2015). 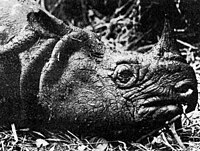 "A Brief History of the Long Fight to End Rhino Slaughter". National Geographic. Retrieved 24 July 2017. ^ Torchia, Christopher (24 July 2017). "South Africa moves ahead on domestic trade in rhino horn". ABC. Retrieved 24 July 2017. ^ Northam, Jackie (28 January 2015). "Tiger Skins And Rhino Horns: Can A Trade Deal Halt The Trafficking?". NPR. "Rhino poaching on the rise, ministers pledge to tackle illegal horn trade". International Centre for Trade and Sustainable Development. 19 February 2015. ^ "The Refusal of Time". Harvard Magazine. 1 May 2012. Retrieved 7 December 2018. This page was last edited on 11 February 2019, at 03:18 (UTC).